Order Natures Plus Source of Life ® Prenatal from the Online Health Food Store UK. Buy Natures Plus Source of Life ® Prenatal 90 tablets and other quality Female Health safely online in the UK. Multi-vitamin and mineral food supplement with whole food concentrates. If you want to automatically receive an email when 'Source of Life ® Prenatal' is back in stock, just leave your email address below. 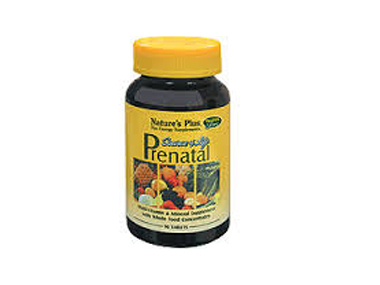 Nature's Plus Source of Life Prenatal multivitamin and mineral. As official Natures Plus stockist in the UK, we sell quality Female Health to customers throughout the UK in England, Wales, Scotland and Northern-Ireland. For over 40 years Nature's Plus has been a Manufacturer and Supplier of Natural Vitamins and Nutritional Supplements. View more products on the Online Health Food Store from Natures Plus. Where to buy Natures Plus Source of Life ® Prenatal safely online? Shop at the Online Health Food Store if you are wondering where you can buy Natures Plus Source of Life ® Prenatal 90 tablets safely online in the United Kingdom. Our Health Shop is located in the UK and our award-winning independent has been serving customers in England, Wales, Scotland and Northern-Ireland since 1976. You can buy our Natural Vitamins and Nutritional Supplements and other quality Female Health online and we post out orders to any UK address. Source of Life ® Prenatal - Natures Plus Source of Life ® Prenatal 90 tablets in Female Health and Herbal Remedies, Tinctures & Supplements.